The Chennai Metro Rail is a rapid transit system which began operations on the 29th of June 2010, in Chennai, Tamil Nadu.A part of the Phase 1 of the metro system is under operation and the rest is under construction. Currently a 10 km long line, serving 7 stations, the Phase 1 of the metro system has 2 more lines planned, serving 42 more stations. On completion, the network will span over a length of 45 km. Operated by the CMRL, the system was recognized by the UITP in 2011. 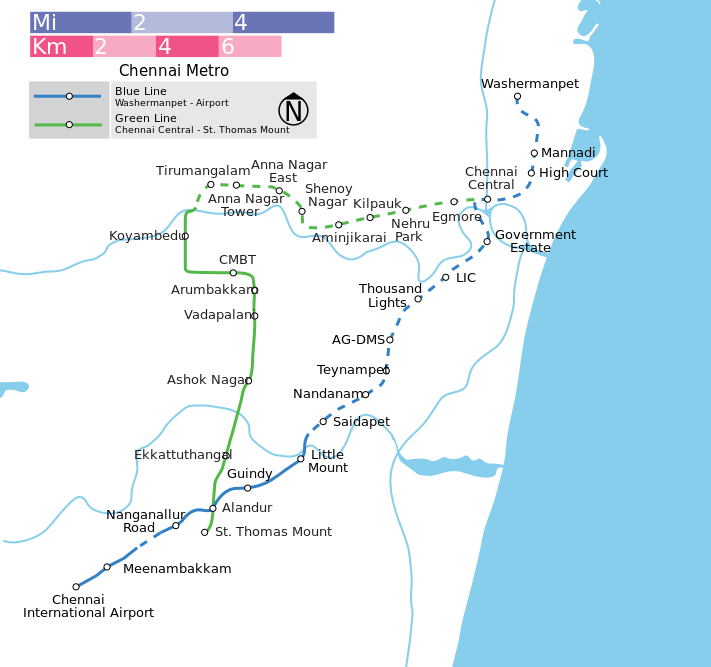 Map of Chennai Metro Showing Stations and Lines of Phase 1 & Phase 2. Click on the Map to Enlarge it. The metro service begins operations at 6:00 am in the morning and runs till 22:00 pm in the night, on weekdays. On Sunday’s the metro starts a little bit later at 8:00 am in the morning and runs till 22:00 pm in the night. Between 08:30-10:30 in the morning and 17:00-20:00 in the evening/night on weekdays, the rush is maximum. During these peak hours, the time interval between two trains is 10 minutes. At all other times, the headway is of 15 minutes. Services on Green Line of Chennai Metro rail has started between Koyambedu and Alandur. The passengers have an option of purchasing a store value card. The initial store value in the card is Rs 50. Another Rs 50, is also applicable but it is subject to a refund. The minimum recharge amount for the card is Rs 100, while the maximum amount is Rs 3000. The number of trips one can make depends on how much you use. The benefit of having a store card is you get a 10% discount on the normal fare for every journey. For tourists a special Tourist Card is available which is valid for one day. It costs Rs 150, out of which Rs 50 is refundable. The card provides access to unlimited rides for that particular day. As part of the first phase, two metro lines are under construction. Parking and ride facilities are available at 6 stations namely, 1. Koyambedu 2. Arumbakkam 3. Vadapalani 4. Ashok Nagar 5. Ekkattuthangal 6. Alandur. Parking is at the owner’s risk and no refund is available on parking charges. It is advisable to carry luggage which is 15 kgs or lesser, with the dimensions of 60 cm length x 45 cm breadth x 25 cm height. While using the escalator, stand on the left side and make way immediately after use. Your ticket or travel card must be with you at all times and each ticket/travel card is for one individual only. The yellow line on the platform should not be crossed for safety concerns. Pets are prohibited within the premises of the metro network. Knives, firearms and smoking is prohibited. Eating consumables inside the station as well as the train, is not allowed. is metro train running between Chennai central and Chennai airport? Is this a safe one? how to go to domestic air port from navallur area/ by metro ? which is nearest metro station?